Evidence that higher inflation could be on the way is very good news for B of A. Investors who have waited patiently for Bank of America's (NYSE:BAC) stock to finally move past the doldrums from the financial crisis now have a tangible reason to be optimistic. On Thursday, the yield on the 10-year Treasury note climbed to its highest level since a majority of people in the United Kingdom voted in June to separate from the European Union, unleashing uncertainty in global financial markets and sending shares of Bank of America and its peers plunging. 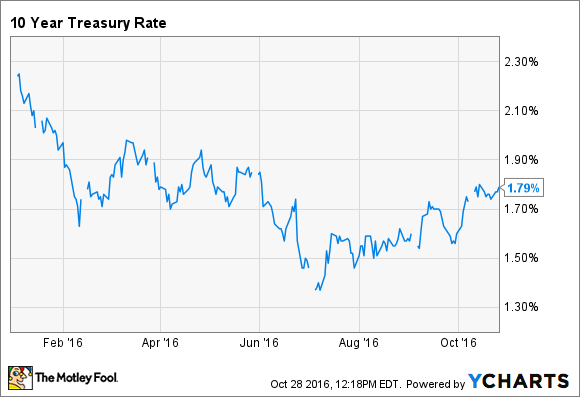 Why are higher yields on the 10-year Treasury note such good news? They're good news because banks generate revenue from lending money on a long-term basis. And the interest rates they charge on loans are tied to government bond yields. Thus, when yields on government debt climb, so should bank profits. In Bank of America's latest quarterly regulatory filing, it estimated that if long-term rates were to climb by 100 basis points, or 1 percentage point, then it would earn $4.5 billion more in annual net interest income. That alone is good. But there's more. Now inflation is ticking up again, and these markets are coming under pressure. If higher inflation were to materialize, that would give the Federal Reserve a strong incentive to raise short-term interest rates as well. It's been on the verge of doing so all year, but the one thing that's stopped it is the fact that consumer prices aren't rising at the 2% annual rate targeted by the Fed. Higher short-term rates would further catalyze Bank of America's top line. To this end, if both short-term rates and long-term rates rise simultaneously by 100 basis points, then Bank of America projects that it'd earn $7.5 billion more in annual net interest income. To be clear, there's little reason to think they'd rise that much that fast, but even a small boost in rates would translate into higher revenue. Suffice it to say that would go a long way toward helping the nation's second-biggest bank by assets achieve its objective of raising its return on assets from 0.9% last quarter to above the 1% benchmark that investors expect from a bank its size.